Our product range includes a wide range of rebonded foam. Our organization is actively indulged in offering a premium quality Quilts to our patrons that are perfect for Rebonded Foam. 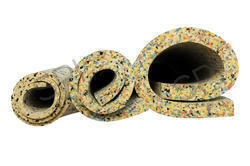 These are used in mattresses and carpet overlays. Made available in various size and sturdy patterns, offered foams fulfill the specific needs of our clients. Moreover, these products are delivered to our clients only after performing a series of quality testing on various quality parameters by best quality experts.